So, I’m writing for this new site called Funcurve now! Basically it’s a website where reviews are structured by a chart of our impressions of the series over time, which is a pretty neat system. Plus, we’re given free rein over the way we work with that chart. I’ve been asked to review Barakamon, which is great because Barakamon is a wonderful series that I’m super happy to rewatch and write about. Expect a full review in the next month or so. For now, I’ve got an excerpt from my first draft of the review. I decided I’d start by doing the first episode individually, because I feel it’s a really great first episode that stands on its own. You can find it below. Enjoy! 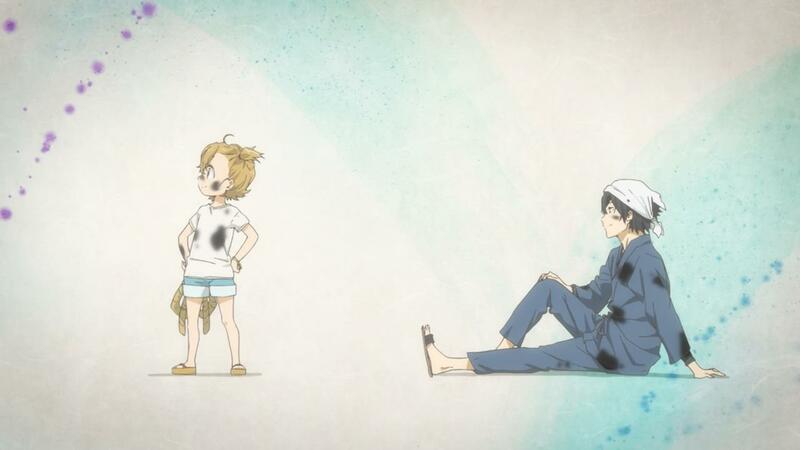 Barakamon is one of those Anime that manages to win the hearts of everyone who watches it. Well, of course no work of art can actually be universally loved, human beings are way too complex for that, but it sure feels like everyone who’s seen Barakamon loves Barakamon, and with good reason. It’s a series brimming with earnest warmth and passion, one of those rare feel good works that I would argue even people who don’t watch Anime could easily watch and appreciate. Barakamon follows Handa Seishuu, a young Calligrapher who finds himself on a rural Island in Japan trying to rediscover his passion for calligraphy. Along this journey he meets an energetic little girl named Naru Kotoishi, who along with the other free spirits of the island teaches Handa to understand his own unique creative identity. We writers tend to gush over these stories that touch on ideas of creative identity in a meaningful way, because we as writers are also creators, brimming with self-doubt and constantly trying to get in touch with why we do what we do, and we find a catharsis in seeing these narratives. Barakamon isn’t the most focused narrative of this type, but it still understands what it means to be a creator, and it’s an incredibly charming story to boot. I want to begin with the first episode on its own, because I feel it tells its own story, one which the rest of the series is an extension of. Handa is sent to live on the aforementioned humble little island after stubbornly refusing to take criticism for his fundamentalist calligraphy works. Actually… he didn’t just stubbornly refuse to take criticism… he punched the curator in the face, and worse still he refused to apologise for it. Handa clearly takes his rigid style very seriously, even though everyone around him knows that he’s buried his passion for calligraphy underneath those fundamentals. He finds himself in the middle of nowhere, unable to understand a word of the local dialect, acquainted with vast stretches of countryside and cicadas chirping and old fashioned houses with old-fashioned appliances, a glowing atmosphere that we become comfortable with very quickly, but one that Handa himself has to get used to. His world’s been turned upside down, and he has to change his perspective. From there we get some chuckle worthy and genuinely endearing Slice of Life shenanigans, of which Barakamon is loaded with, wherein we meet the town mayor and Naru, the careless youth who changes Handa’s world. Handa tries to concentrate on his calligraphy, but he’s still hurting after having his style criticised by the curator, and amongst that he’s lost his drive. As a creator even the most well-meaning criticism can be deflating, because you feel a part of you exists in what you’ve made, and Barakamon is able to reflect on that self-conscious instinct. Amongst this we get some more quirky Slice of Life moments where Naru distracts him from his work. Naru takes a look at his calligraphy and finds herself impressed that “it’s just how [her] teacher writes at school”. Of course, unbeknownst to Naru, this echoes the curator’s criticism that his style is very ordinary and uninspired, and it’s made implicit that Handa starts to understand what’s wrong with playing it safe when he takes the paper and scrunches it up, though he has a long way to go before openly admitting his shortcomings. The first major touchstone of the series that sets the tone for everything that comes afterwards is when Naru tries to climb a flood wall to see the sunset. It’s a cloudy day, so Handa is doubtful he’ll even see a sunset and refuses to follow her, to which Naru responds by telling him that he “ain’t gonna’ know unless [he] climb[s] up [himself]”. Handa ends up following her, and he sees the gorgeous sunset Naru promised. Handa goes back to his dingy little house later that night, and in a wild flurry of inspiration splatters his canvas with ink with the character for ‘fun’. Naru is symbolic of the spirit that makes us create, and of the rewards of seeking new things, and through her Handa learns both those things. Afterwards he makes a phone call to his friend, Takao, admitting he was wrong, but saying he wasn’t ready to personally apologise to the curator. Handa learned a valuable lesson, but he still has a ways to go and he knows it. Barakamon’s first episode is a densely packed narrative on its own, and that’s what makes it so incredibly good. Though it still leaves room for Handa to develop, it gives you the whole overarching narrative and hits the strong character beats it needs to, but at the same time its breezy Slice of Life moments give it all the necessary breathing room to convey emotional resonance. This episode truly encompasses everything great about Barakamon.